So about a week and a half ago the orange train and I headed off on another side saddle adventure, one I had been looking forward to for weeks. Ciara O’Connell (this lady: http://sidesaddleciara.wordpress.com/) had organised for a group of us to travel back to Ballyduff House near Thomastown in Kilkenny to avail of lessons with side saddle instructor Jennifer Torrance before staying over and heading to Mount Juliet the following day to hack out. As usual I was a little late. I am at this stage convinced that the universe is f**king with me and I am destined never to be early for anything. After an unfortunate 40 minute delay getting a light bulb in the jeep replaced (how many men who work in a garage does it take to change a light bulb? Three apparently! ), I got her ladyship loaded up and we set off on a journey down the M9. Coming off the M9 and travelling out of Thomastown I got the fear – you know the one the ‘oh Jesus I haven’t a breeze where I am’ fear. So I did what any sensible person would do and followed another horsebox thinking that surely they would be going to the same place. Except they were not and I was pretty sure I didn’t recognise the road I was on. I rang a friend who did her best to help but given that my only answer to ‘where are you’ was ‘um on a back road with lots of trees’ there was not a lot she could do for me. So hoovering emergency chocolate for stress relief I kept on my way following instructions online and arrived at Ballyduff. It turned out the directions I had were different to the ones I had last time which was why I didn’t recognise anything. Panic over. Having been quiet as a lamb the entire way down the horse of course decided to do a dance of impatient excitement while going through the gate and managed to graze her coronet band which was thankfully nothing serious. To be fair to her the horse must think that the horse box is the entrance to Narnia at this stage as once she goes in god knows where I will have brought her or what we will be doing when she gets out! We got tacked up at speed and headed down to the field and on the way Dolly had a very emotional reunion with Ralph the lovely gelding whose bum served as our brakes at the hack at Borris House and whom she has taken quite a shine to. Once on board it was time to join Karen Coffey and Dani Murphy in the arena and get working. The problem with side saddle is that most people don’t know a whole lot about it will tell you when watching you that you look lovely and elegant and are doing a great job. That’s all grand until you are riding in front of a UK showing champion instructor who knows what all that is actually supposed to look like. All of a sudden pointing your toe and allowing the horse to distract everyone with her big trot won’t quite cut it. My rogue right shoulder was insisting on moving up where it should not be. Jennifer advised me on twisting my hips to bend instead of focussing too much on my shoulders and also advised me on pulling my shoulders back and down to sit up straight. This all felt like I was twisting myself in half and was not helped by the horse taking advantage of me focussing on my position and fecking off in an over the bit fast canter. That said it did look better and gave me an awful lot that I need to work on and practice at home. 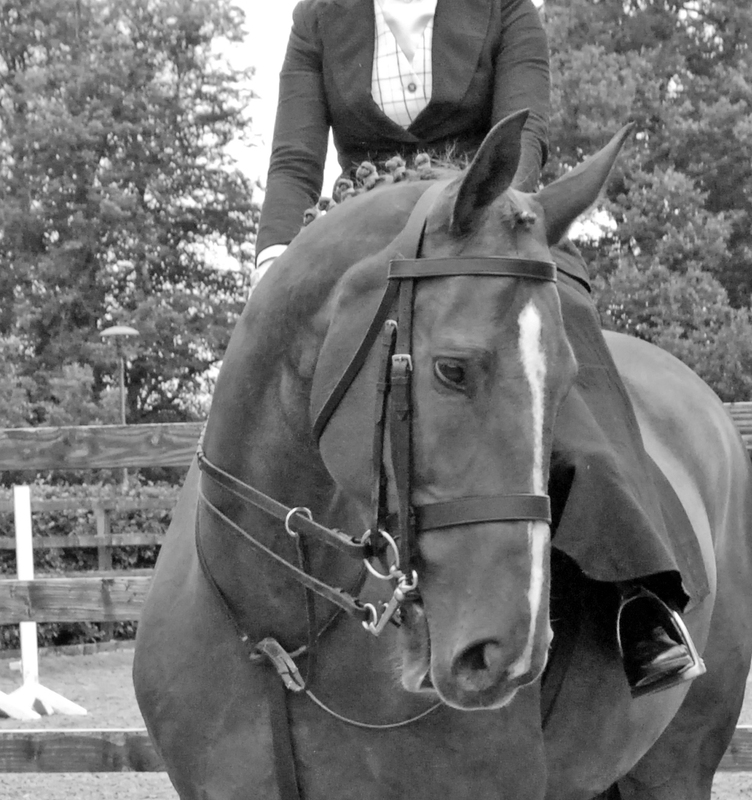 I thought my left rein would be great compared to the right one (the horse and I love the left rein, neither of us is a natural ambi turner) but I was advised to be careful of being too loose in the saddle and was shown how to anchor myself in a little more. I suspect that fact that I had only ridden aside once in a few weeks was letting me down here. One thing that dramatically fixed the looseness was a spot of show jumping where the whole ‘grip or fall off’ situation always triggers some sort of grip instinct in my legs. Given the airs above the ground that accompanied poles on the ground last time we decided to give those a miss and head straight to jumping. I expected the horse to find this very exciting so she decided to make a liar of me and was good as gold riding steady and calm into the fence. In a rare moment of braveness I asked for the fence to be put up, and then up again and each time the horse just did exactly what I asked. In the meantime I just did my usual jumping position of look right, lean forwards and hope for the best. Our lesson ended at that point which allowed time for a horse swap with Dani’s chestnut mare. One of the three talented Swedish ladies who had joined us for the weekend did not have a horse to ride so we got her mounted up on Dolly so that she could show us how it is done. With a busy afternoon over we settled the horses for the night and went to find our rooms in Ballyduff House. The house in itself is a work of art with so much history and detailing from hunting inspired ornaments to old oil paintings to oriental detailing on the wooden panels of a wardrobe. You could easily lose an hour just exploring a hallway. We enjoyed a Chinese for dinner and a few drinks in the large dining room before retiring to bed. The next morning my roommate Sarah Conway (rider of the lovely Ralph) and I were up early to feed and beautify the horses. While the weather had been sunny and warm on Saturday evening it was now dark, damp and p*ssing rain. After a quick breakfast we were loaded up and on our way to Mount Juliet where eighteen of us would hack out around the grounds. We arrived at Mount Juliet and I was amazed that the horse was happy to stand beside the box while I tacked her up and dressed myself – I thanked Ralph’s calming influence for this as normally she would have been off up the avenue exploring god knows what. We mounted up and at this point the rain had cleared up. 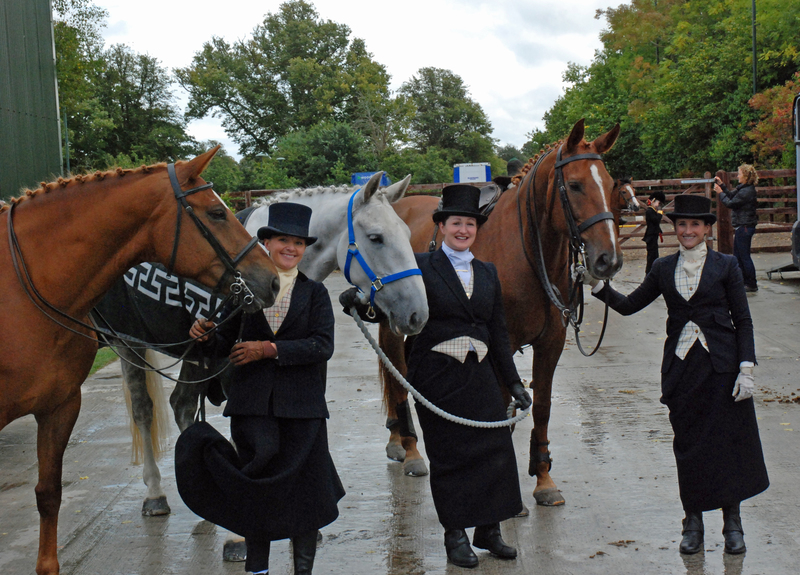 It was amazing to see so many side saddle riders in the arena from Ireland, Sweden and Holland. 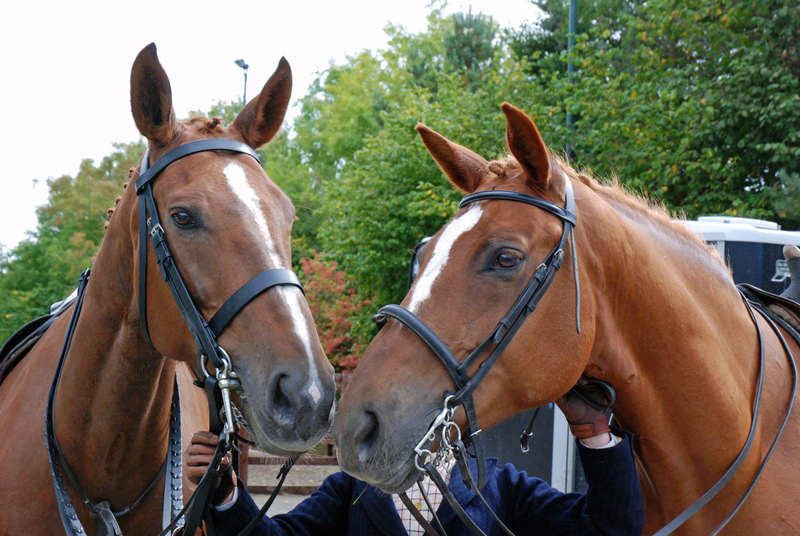 I was incredibly relieved when our Mount Juliet guides advised that we would have two groups – one that would canter together and one that would not. The horse is very enthusiastic about cantering in a group and unfortunately that usually means my arms are stretched trying to remind her that we are not in a showing class and need to stay behind. It was our first time hacking out in a big group aside and I was quite frankly a nervous wreck especially heading over the high bridge across the river. Thankfully I was flanked by Dani Murphy and Karen Coffey on their mares Coronado and Lola who managed not to kill me and distracted me enough to cop on and ride the horse. Once we set off we were grand and our group trotted along the river and through the woods. My first hack at Mount Juliet took place in Spring where I had only ridden aside twice before and rode their pony Harry so it was nice to be back at the venue on the big mare having learned a lot in between. The two groups met up at the Mount Juliet cross country field. I decided to tackle the small step fence to see what would happen and the horse happily jumped it. 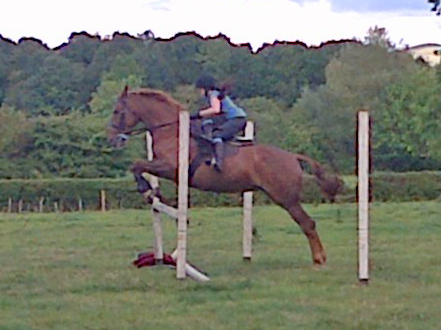 She has done very little cross country but we schooled astride recently and I was hoping some of it had sunk in. I had a canter up the field to test the brakes and was delighted to find they were working (thank god for double bridles) and I had had the sense that morning to add a martingale to give me a ‘Jesus strap’ to hold on to. As usual I had all intentions of just doing a fence or two but decided when the adrenaline kicked in to throw caution to the wind and aimed the horse at a few of them. First a log on the hill, next a tyres fence that I had been in awe of people jumping last time. It was so strange but over the tyres my brain and body suddenly clicked into sync and suddenly I didn’t feel like I was sat up sideways anymore – it just felt right! So off we went up over the log again and this time the mare put her eye on an upright a few strides out so on and over we went. She locked onto the small bank and we popped up and over it. Heading up the field we spotted a set of two steps that from a distance didn’t look too big. It was only when I reached them and the horse launched over the first I realised that they were in fact bigger than I realised and I had not factored in that unless I leaned forward quickly gravity would have me left behind – thank god for the Jesus strap! With all the jumping and excitement out of the way it was time to head back to the equestrian centre and I was delighted to walk on a long rein on a happy and relaxed horse who had clearly enjoyed her day out and had met new friends along the way. We had time for some photos at the centre before un tacking, loading and heading off on our separate routes home with promises of meeting up again soon. Knowing Ciara I won’t be waiting too long for the next adventure to be scheduled! Posted on September 25, 2013, in General, Side Saddle and tagged Ballyduff, Ballyduff House, chinese, cross country, cross country side saddle, double bridle, equestrian, equestrian humour, equestrian shopping, equestrianism, hacking, hacking in ireland, Horse, horse riding, horse riding ireland, horses, horses ireland, hunting, irish horses, jennifer torrance, jesus strap, jumping cross country, jumping side saddle, Kilkenny, martingale, mount juliet, Mount Juliet Equestrian, Mount Juliet Horse riding, ponies, pony, riding side saddle, riding side saddle in ireland, show jumping, Side saddle, Side Saddle Association of Ireland, side saddle instructor, side saddle ireland, side saddle teacher, sidesaddle, Thomastown, turnout. Bookmark the permalink. 3 Comments. Love the idea that the horse must think that the horse box is the entrance to Narnia. thanks! she is very good and doesnt seem to mind what we do but its always funny to see her with a big curious head when we arrive somewhere! What a wonderful weekend. Yourself & D have the best adventures!